As the robots slowly begin to take over everything, it's nice to know that they will at least be pouring drinks during the transition. This cool new Moonshiner from artist Fred Conlon is a liquor dispensing robot sculpture handcrafted from recycled / reclaimed scrap metal, wrenches, and valves. 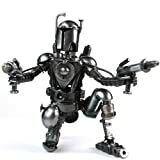 It can wield up to two inverted liquor or wine bottles on its back that are connected to two valve-operated stainless steel dispensers. If you look closely, you'll spot a hidden flask acting as a backpack and a built-in shot glass holding ring on the front. It makes a cool gift for any thirsty, robot-loving friend or display it proudly on your own home bar... at least until the nightmarish robot uprising begins. 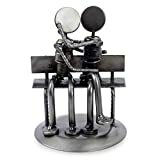 NOVICA Recycled Auto Parts Romantic Metal Sculpture, 4.7"